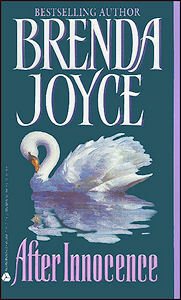 A dreamweaver spinning spells that entice and enchant, a masterful creator of unforgettable characters and incomparable romance, bestselling author Brenda Joyce works magic. Estranged from society, wealthy and beautiful artist Sofie O’Neil finds solace in her private world, She longs just once to taste a forbidden love — to follow the dangerous diamond smuggler Edward Delanza to paradise. But Edward wants far more from the innocent young heiress than a brief and passing encounter. For he is determined to heal her and possess her — now, and for all time. Artist Sofie O’Neill and Edward Delanza are instantly attracted to each other. When fate forces them apart, does their love stand a chance? It was a glorious day. Sofie no longer regretted leaving the city in order to attend her mother’s weekend beach party. A large sketchbook in one hand, charcoal in the other, Sofie paused on the crest of a dune to take in the view. The Atlantic Ocean lapped the shore, dappled from the sun. Above, gulls wheeled. The sky was a nearly blinding shade of blue. Sofie smiled, lifting her face, shadowed by a straw hat, towards the sunlight. It was moments like these that made Sofie realize that there was life outside of her studio’s four walls. Then the throbbing of her ankle brought her back to her senses. She should not linger. Coming down to the beach could still prove to be a mistake. She did have a wonderful preliminary rendering of Newport’s shore, which she would begin in oils as soon as she returned to the city, but an entire evening awaited her, and it would be even less pleasant for her if she was limping more than was usual. Suzanne had a houseful of weekend guests, and Sofie could not help but feel some dread. In truth, if she had her choice, she would lock herself in her room and paint. But she did not have her choice, she had promised Suzanne to be her most sociable self, and Sofie intended to try her best to please her mother. Sighing, Sofie imagined the long evening ahead as she began to descend the dune. She wondered if she would know any of her mother’s guests. She hoped so. As immersed in her world of art as she was, Sofie rarely ventured out into society, and could not converse with strangers and mere acquaintances with the casual ease that seemed to be second nature to everyone else. Her younger sister, Lisa, had once told her that one conversed upon whatever topic was at hand or in sight-such as the beautiful porcelain vase one stood near. It sounded much easier than it actually was. Sofie decided not to worry about the impending evening. No one expected her to be the belle of the ball. Sofie moved awkwardly down the scrub-covered dune in her uneven gait, and after several feet, paused to rest. Trying to catch her breath, she glanced about and her eye caught a flash of bright white. Sofie looked again. She glimpsed a man strolling down another path in the dunes just below her. Like herself, he was leaving the beach, but he had not seen her. The sight of him was so arresting that Sofie froze, completely forgetting herself and the rest of her surroundings. He was bareheaded, his thick black hair a startling contrast to the stark white of his finely tailored linen sack jacket. He wore it casually open, its sides billowing in the breeze, and his hands were shoved deep into the pockets of his pale cream-hued trousers. He was a large man, Sofie could see that, for he was tall and broad-shouldered, but he moved with the grace of someone much smaller, somehow as lithe and sleek as a black panther she had once seen in the Bronx Zoo. Sofie was captivated. From this distance she could just make out his tanned features, which seemed to be extraordinarily handsome. She had to paint him. Abruptly she sat down, flipping open her notebook. Her heart thundering in excitement, she began to draw. Sofie’s hand froze as, startled, she watched a woman flying up the path after the stranger. Sofie recognized her neighbor, Mrs. Hilary Stewart. Why on earth would Hilary be running after this man in such a fashion, with her skirts lifted high in one hand, shamelessly revealing long, white-stockinged legs? Then it dawned on Sofie what Hilary might be about, and she blanched, shocked. Sofie sternly told herself that it was not her affair and that she should go. Quickly she tried to finish the study of the stranger, adding a few last strokes. Then the sound of his voice, male and low, silken and baritone, made her hand still. Sofie lifted her head, finding herself helplessly ensnared by the masculine sound, involuntarily straining to hear. Hilary was clutching his shoulders. She swayed a little, as if pushed by the breeze — or as if waiting for his kiss. Sofie’s heart beat double time. It was as she had thought as she had feared. She dug her fingers into the warm sand, her sketch forgotten, knowing she must go before she saw something she had no right to see-but she was unable to move, absurdly paralyzed. Hilary’s throaty laughter sounded. Sofie eyes widened. Hilary slowly unbuttoned her pin-striped jacket. He wondered if he was growing old before his time-he was certainly too old for this. Africa had not solely been responsible for jading him, but it had certainly convinced him that life’s comforts were worth waiting for. He had no intention of fornicating in the sand when cool, clean sheets would be available later. Besides, Hilary Stewart had only left his bed a few hours ago. His smile was wry. He had met Hilary at a party a few weeks ago almost immediately upon his return to the city. He learned that she had married a much older man just a few years ago and was now newly widowed. Edward preferred widows; they tended to enjoy sinning without feeling guilt or making demands. The attraction between them had been mutual, and they had been carrying on ever since. Now they were both guests at the Ralston’s summer home. Hilary was undoubtedly responsible for his invitation, but Edward did not mind. He liked her outside of bed as well as inside it, and the city was hell in the summertime. Suzanne Ralston, their hostess, had kindly given them adjoining rooms, and last night Hilary had preoccupied him from midnight until dawn. Yet apparently Hilary was far less sated than he was . . .